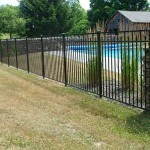 If you own a pool, you must have a fence. It’s the law. 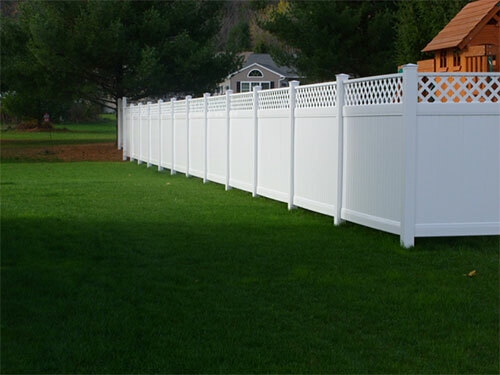 A minimum of 45″ between the horizontal rails and less than 4″ between the vertical pickets. Its all about safety. 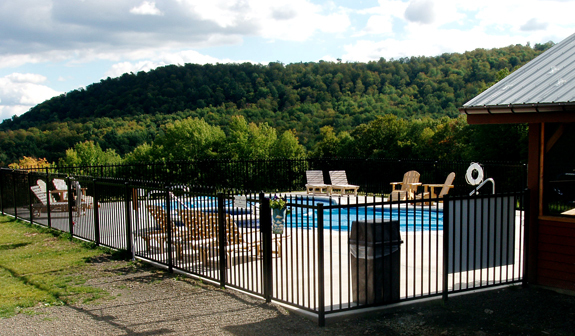 These New York State Pool Code regulations are intended to prevent small children from gaining access to your pool. 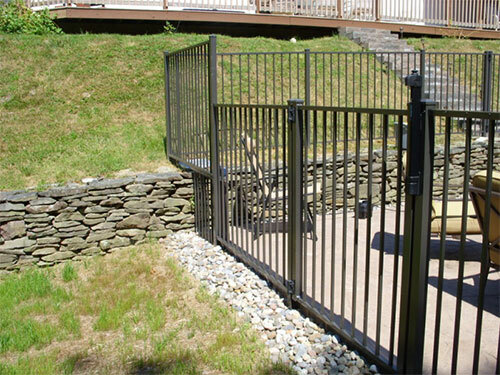 Your gate latches must be at least 54″ above grade, out of reach for small children. 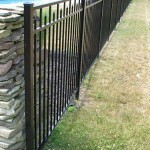 Oneonta Fence will assist you in selecting a fence style which conforms to code. 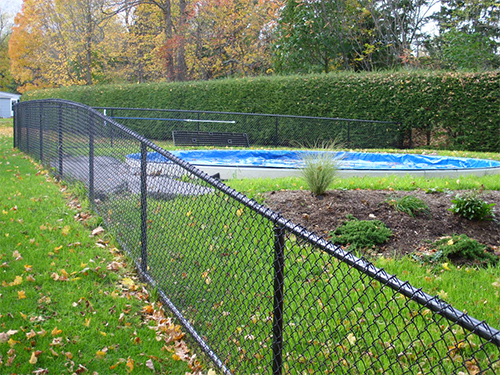 4′ high chain link may not be the most aesthetically pleasing option, but it is invariably your most affordable option for fencing in a pool. 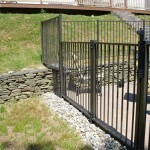 A bottom rail isn’t required by law, but does give chain link a more pleasing appearance. 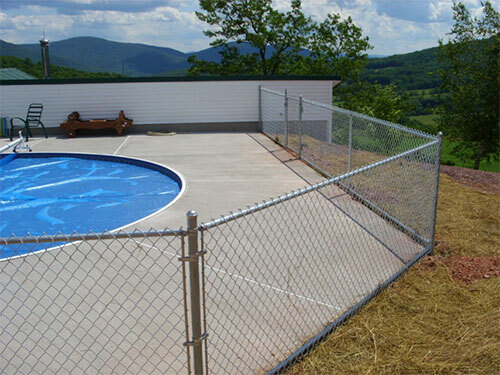 Our Total Vinyl Chain Link available in black, green, brown and even white are popular choices for pools. ROXBURY 2012 Pool enclosures don’t have to be fancy or expensive. 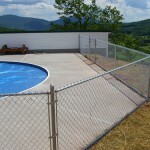 This 4’ high galvanized chain link fence does the job and meets code too. 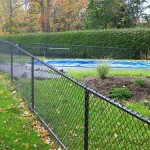 We built this 4’ high black vinyl chain link fence the day after the pool was installed. We installed an inexpensive wire fence behind the hedge where no one can see it. 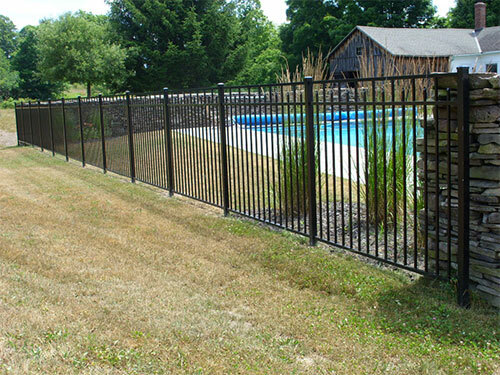 In our local market, aluminum is probably the most popular choice for a pool fence. 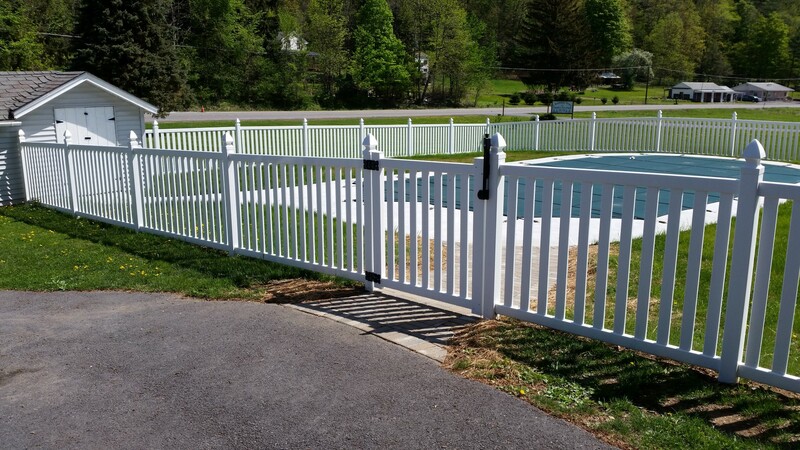 Because the posts, pickets and rails are relatively small, your view of your immediate surroundings is minimally obstructed by aluminum or chain link. 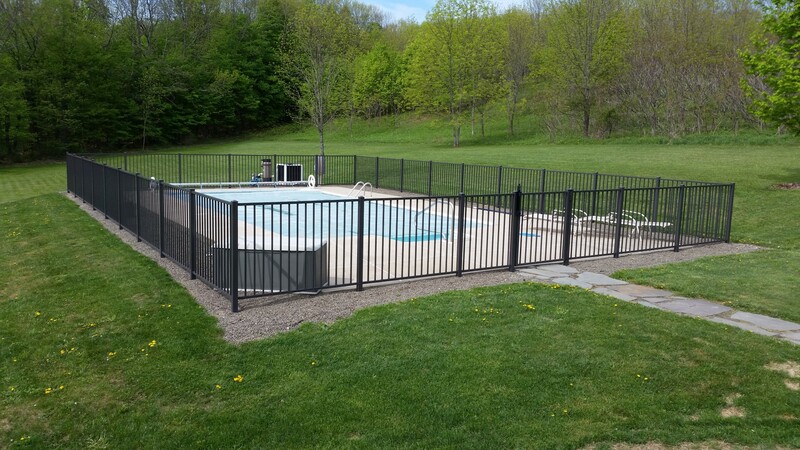 AUGUST LODGE, COOPERSTOWN This is a 4’ high Ornamental Aluminum fence that we installed in 2007 at the August Lodge off Route 28 south of Cooperstown. Cooperstown 2014″ Look closely. The color is dark bronze. UNADILLA 2011 A simple 4’ high Ornamental Aluminum pool enclosure. 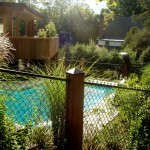 The fence is a nice compliment to the stone wall sculpture in the area. 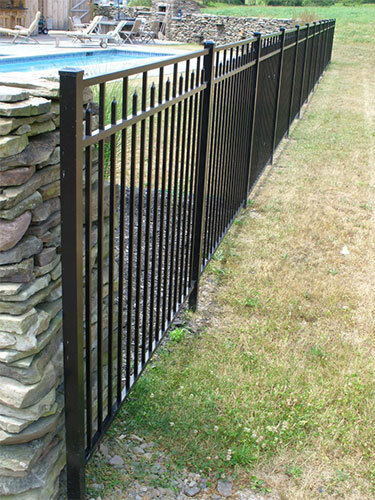 ONEONTA 2011 This 4’ high Ornamental Aluminum fence meets NYS Pool Code requirements. The tricky part was dealing with the existing stone wall. 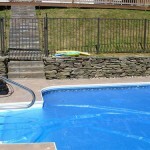 White vinyl is a popular choice for swimming pools. 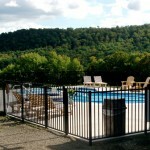 There are several 4′ high styles that conform to New York State pool Code. 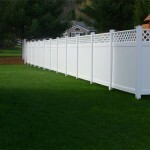 Bufftech, one of the largest vinyl fence manufacturers in the country, is our primary supplier. You can see a wide variety styles on the Bufftech website at www.certainteed.com. Otego 2014. 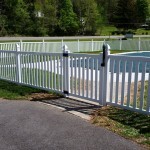 Notice the gate latch.. It’s set at 54″ above grade in compliance with pool code. PRIVATE POOL You may not be able to see the pool but its there trust me, it’s all about the privacy.